Let me introduce to you EY 09 Ritzy. 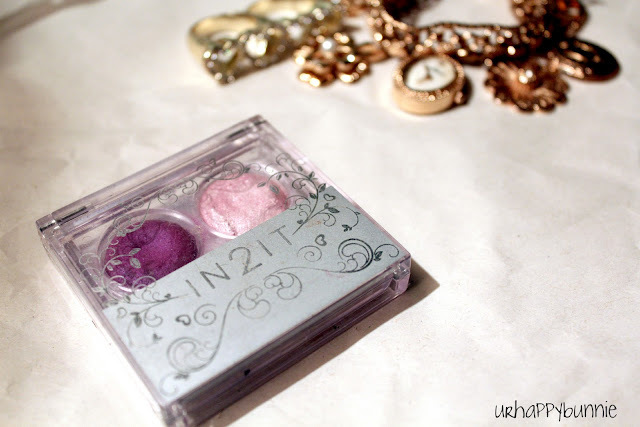 A Sheer Eye Color duo from IN2IT Cosmetics. I know most have probably never heard of the brand but it's an Asian brand. 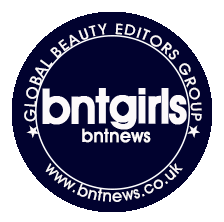 The brand is owned by Asia Pacific Cosmetics Corporation, Hong Kong and its available in Thailand, Malaysia and Philippines in select department stores and drugstores. I have read somewhere that it is also available in Singapore and other Asian countries but this, I don't know for sure. It is highly pigmented, blendable and buildable. It is a long wearing eye color with a shimmering pearl and micro glitter formulation. The product is infused with aloe vera, bran oil and vitamin E for a smooth application. Since this brand's products are specifically made to suit Asian skin, which had oilier skin due to the hot and humid weather, more prone to skin irritation, and blemishes, this is perfect for people who have the same problems. I've had this eyeshadow duo for a year now and it has been one of my favorite buys ever. Whenever I wear one of the shades or both I always get compliments on how vibrant, pigmented it is and how it compliments my eyes and skin tone. The shadows work really well without a primer too. This is a highly recommended brand and product. They have other amazing products as well and there's only one product from them that's a huge miss for me so far and that is their Waterproof Eyeliner Pen. It's supposed to be waterproof and dries matte but I'm sorry to say that it's a fail in the waterproof department. It smudges and sweat makes it run down your eyes. It is horrible so be wary of that item. If ever you will go to visit Thailand, Malaysia, Singapore and Philippines please do visit the department stores' and drugstores' beauty section and take a look at IN2IT. Their products are cheaply priced for the amazing quality and if I remember correctly I bought the duo for roughly around the price of $2-4 only. The colors are both really pretty. what a gorgeous pink eyeshadow! Amazing colors! It looks perfect!! I love it! woooaaaa love the colors!!! beautiful look!!! Great colors! I've never been to any of those places yet but If I do I'll be sure to check out these. Oh how pretty and girly!! I love it. I wish I could find it in America! U think I could find it on ebay? Lovely colours, and you have beautiful eyes. That is my new fav pink color and it looks great on you!! Thanks for sharing. very pretty, I love the purple on you! Gorgeous colors, thanks for visit my blog ! how cute the make up!! just love the blog!! feel free to check out mine and let me know if you want to follow eacj other! I love these colors - so fun! OH love the color! Vry very pretty. A year or a little more than. And it doesn't give me any irritation. I haven't had any problems with makeup expiring. Plus this is more of a mineral shadow. wow what pretty makeup! I love it! amazin' colors remind me about smth fairy! We had not heard of this brand! You are right the pigmentation is great and we love your eye look using the palette. Thanks so much for coming over to our blog and following. We are following you back! Hope you have a great weekend! wow! beautiful colors & superrrr pigmentation!!! This colour eyeshadow looks great on you. And I love the big-eye contact lenses, super cute! And thanks for following of course! Thanks you for following my blog! Also like yours! Start following you! Did you already liked my facebook page? great blog, i'm following you, too. Thanks for your comment on my blog. Love your post here, love the colour of the make-up. These look like gorgeous colours, & perfectly pigmented! Only wish they carried these in North America! They are pretty and affordable. The perfect combination for me. 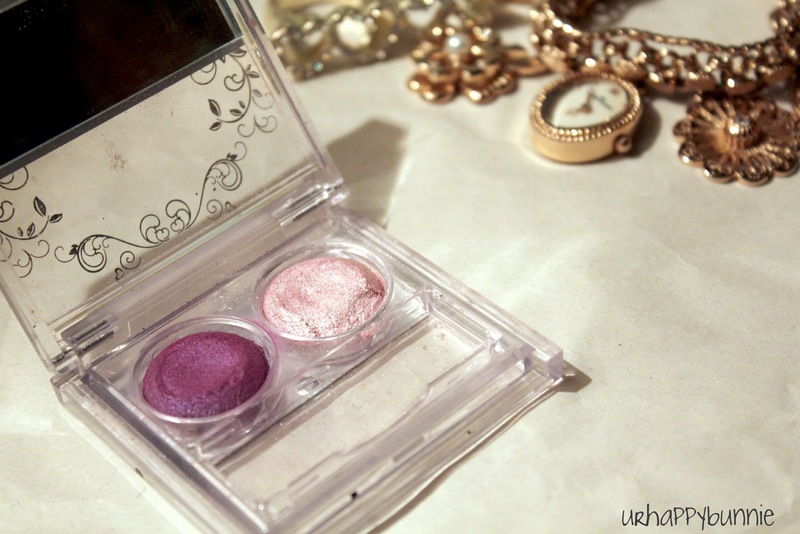 :) Have you tried their blushes, and if so, are they as pigmented?